Russian novelist, Leo Tolstoy, once wrote, "All happy families are alike; every unhappy family is unhappy in its own way." Apparently here in the U.S., all a family needs for happiness is a warm gun. 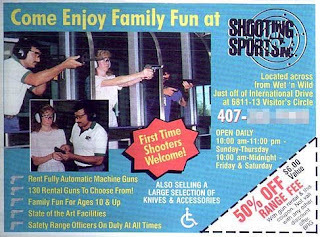 So if you're in Orlando, FL, instead of taking your kiddies to Disney World or Universal Studios, take them to Shooting Sports, located across from the Wet 'n Wild! Nothing says family happiness more than a fully automatic machine gun. This reminds me of the "welcoming" billboard I saw along the North Carolina coast earlier this month.